Traffic Travis can perform a full SEO health check on any site. Traffic Travis is highly effective software that compiles data about your website, from the data you will be able to improve your sites SEO, this means you will rank higher and get lots more visitors when you are creating a website. Why do a full SEO Health Check on any Site? Is your site the best you can get it? Need some help? What are you waiting for use Traffic Travis and do a full SEO Health Check on any site. From the results you can improve your SEO. Traffic Travis will analyze each page on your website, looking at content, keywords, title tags, description tags image alt tags and more. It will even warn you if you have duplicate title tags. The full SEO health check analysis determines if title tags and description tags on each page have the correct about of words in them, helping you improve each pages SEO. Its like having a SEO expert review your work and correct any mistakes they find. We all battle with on-page SEO and this SEO tool can be a big help. Find out how your competitors site is optimised? Why do other sites out rank you on Google? Traffic Travis can tell you why. It will keep an eye on your competitors and let you know when you need to target new keywords. From the start you will be able to see what position your site is on in different countries. Type in your keyword, the country you want to check your site position, next the keyword and Traffic Travis will show you the exact position. When your position moves up or down you will know. This is good info to have at your finger tips. Below is a sample of our website, here you can see how the website analysis tool works. Using the search term how to create a website you can see the position in Google position 8, Yahoo position 8 was position 18, Bing position 9 was position 10. Keep track of your sites position on all 3 search engines. You can find the position of any page on your site for its keywords, keep track of all the pages on your site and their keywords, you will be the first to know when they move up or down on search engines. Meta description tags are the correct length on each page. Meta title tags are the correct length on each page. Analyze main body text content and give report. Find duplicate Meta tags that can harm your SEO. Find and show you back-links pointing to your site. 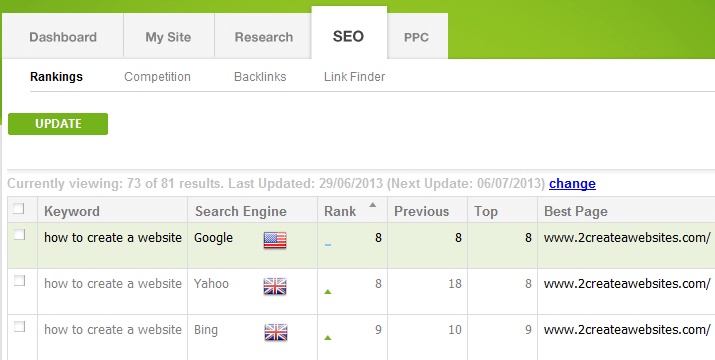 See site position in Google, Yahoo, Bing for different keywords. Checks all H tags and lets you know if there is a problem. Traffic Travis performs a full SEO health check on any site. Take advantage of one of the best SEO tools and preform a full SEO health check on your site. Check your sites position on Google, Yahoo, and Bing and site health weekly for free. Traffic Travis is great! If you want one of the best search engine optimization tools to preform a full SEO health check on any site and from the report improve your websites on-page SEO and search engine rankings then why not try it free. Get even more reports with the full version, its a one off payment and well worth it. Trusted by over 400,000 Webmasters. 1pagerank.com is another nice SEO tool that you can use to get some more stats on any site. It gives you a score out of 1000 and as you update your site check and see if the score has improved. nibbler.com Want to know more about your website? Enter the address of any website and nibbler.com will give you a report scoring the website out of 10 for various important criteria including accessibility, SEO, social media and technology. We are here to help you make a website, and help you understand what your web presence may be lacking in terms of SEO that’s why you should do full SEO health check on your site from time to time.